Damien Thorn has to be the winner of creepiest kid in film...except TOSHIO! Josh. Mikey. Lillith. Esther. Samara. Toshio. Young-Ju. Rhoda Penmark. Danny Torrance. Gage Creed. Regan MacNeil.Damien Thorn. Isaac Chroner. Henry Evans. The Brood. The Midwhich Cuckoos. If these names don’t ring a frightening bell, then you may not be very familiar with the sub-genre of horror movies involving Creepy Kids. It’s one of my favorite sub genres for many reasons. Mainly it’s because our culture holds the innocence of children for granted like a sacred cow. We have to believe that children are born good, and that it’s society which screws them up. If a child were born evil, how would we ever be able to do anything about it? That very question is the title of a great Spanish horror movie from 1976 called Who Can Kill a Child? (aka Island of the Damned, aka ¿Quien Puede Matar a un Niño? This sub-genre exploits one of our deepest fears: What would I do if I knew my child were evil? That’s the question today’s film grapples with. A couple of British tourists end up on a small island in Spain where the children are killing all the adults. Even though they figure it out, they seem powerless to do anything about it because our social mores forbid us to harm a child. The genius of this film begins from the first frame. There’s a documentary introduction cataloguing the atrocities man has committed throughout recent history, from Auschwitz to the Indo-Pakistani Civil War, from the Korean War to the Viet Nam War to the Civil War in Nigeria. 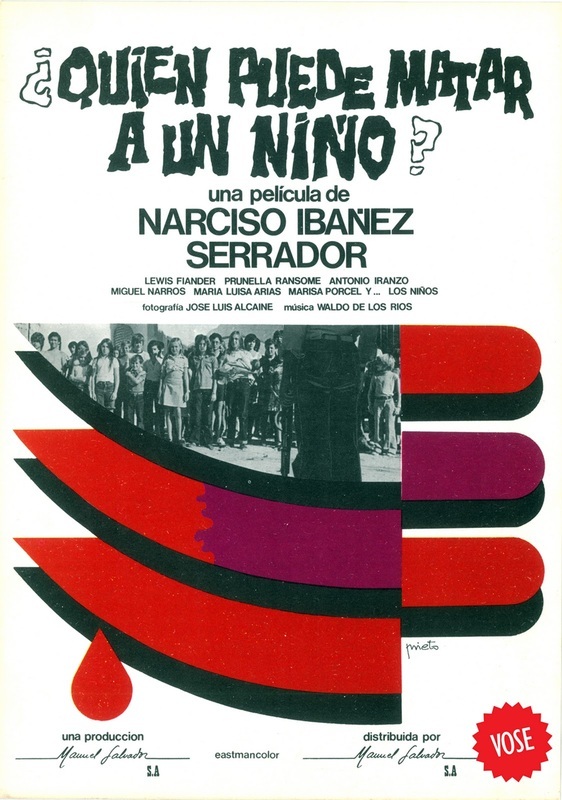 Director Narciso Ibáñez Serrador juxtaposes disturbing actual documentary footage of atrocities thrust upon children due to wars with a recurring musical motif of children singing sweetly and laughing. It’s very unsettling. It’s as if Serrador is telling us that this motif of child abuse is about to become a child’s game…and indeed it does. The idea of children killing adults for no apparent motive is so incomprehensible to adults that the German video version of this film was titled Tödliche Befehle aus dem All, aka Deadly Orders from Space even though there’s absolutely nothing in the film about children receiving instructions from outer space! It’s a concept we simply cannot wrap our adult minds around, even though when we were young, I’m sure there were adults we’d loved to have harmed if not outright killed. The ending is not what you will expect and I won’t ruin it here, but this unknown gem is worth watching. It’s got the usual horror movie conventions, the isolation of the island, the falling while running away, the car engine that won’t start, but it’s also got kids using a dead old man as a piñata! So there’s that! It a great example of the Creepy Kid Horror Sub-Genre. (This film was remade in 2013 as Come Out and Play).